The No. 15/15 Quinnipiac Bobcats head to Cambridge, Massachusetts on Friday to face the No. 4/3 Harvard Crimson. Ted Donato's Crimson team is off to a blazing 9-2-1 start on the season. They have yet to lose a home game at Bright Hockey Arena this season with the only blemish a 1-1 tie against Colgate. Harvard's two losses this season have come at the hands of Boston University and Quinnipiac both on the road. In its last five trips to Bright Hockey Center, Quinnipiac is 2-1-2 with four of those five games reaching overtime. In its last meeting back in early November, Harvard outplayed Quinnipiac for the majority of the game yet still came away empty handed in a 4-2 loss. Since the last meeting, the two teams have gone in opposite directions with Quinnipiac going 4-5-1 while Harvard is 5-1. If Quinnipiac wants any chance of an at-large bid in the NCAA tournament they need to beat Harvard. Without a win over Harvard I do not see not many opportunities for the Bobcats to move up in the pairwise rankings with the schedule they have down the stretch outside of games against Union and possibly Cornell. This would require Quinnipiac to win the ECAC tournament to keep its hopes of a fifth consecutive trip to the NCAA tournament possible. Harvard on the other hand barring a major collapse down the stretch is practically a lock to make the tournament as they are sitting comfortably fourth in the pairwise. The Harvard offense has been relentless this season. They are averaging 4.50 goals per game this season but that number jumps to 5.33 goals per game in their wins. 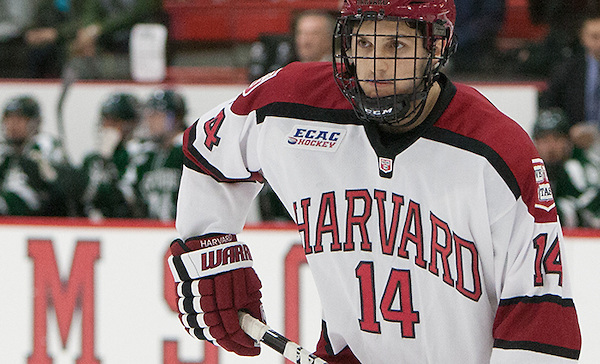 Harvard has yet to win a game this season scoring less than four goals. Six players are averaging over a point per game and seventh player is right on the cusp of that number. The talent on this team is playing to its potential and right now they have the look of a team destined to reach the Frozen Four in Chicago. It's the seniors that are leading the way up front for Harvard as Alex Kerfoot leads the Crimson in scoring with 20 points (5 goals and 15 assists). Sean Malone has 16 points (9 goals and 7 assists) while Tyler Moy also has 16 points (8 goals and 8 assists). Another senior Luke Esposito has 14 points (5 goals and 9 assists) while sophomore Ryan Donato has 15 points (8 goals and 7 assists). Sophomore Lewis Zerter-Gossage is also a big contributor with 11 points (6 goals and 5 assists). 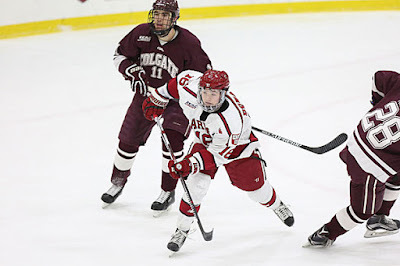 They also get big time offense from the blue line in freshman Adam Fox 16 points (1 goal and 15 assists) but its unlikely he will play Friday as he will be returning to the Harvard from the World Junior Championships. Not having Fox will hurt Harvard's transition game a bit but they still have loads of talent to make up for his loss. The Crimson have the top power play in the country at 30% (18-of-60) so Quinnipiac will need to really play a clean game even though the Bobcats are effective at killing penalties. You cannot give Harvard man advantages time and time again and expect to win. The Bobcats also need to force the Crimson to play from the outside to take away time and space along with having an effective transition game from their defense. Harvard's defense is really the story of their season so far. Its been night and day from past seasons where the defense had failed them. They are giving up 2.25 goals per game which is 11th in the nation and second in the ECAC behind Cornell. Adam Fox has been one of their best defenseman but as I said earlier is unlikely to play after having played in the World Junior Championships. But the Crimson still have many others that get the job done in the back end like freshman John Marino who while doesn't have the point total as Fox does might be the best defensive defenseman on the roster. The play of Fox and Marino has rubbed off on better play from senior Clay Anderson, junior Wiley Sherman and sophomore Jacob Olson. They have all contributed in making Harvard a very good team in transition and shutting down their opponents on the ice. The Crimson can improve on the penalty kill as they are 31st in the country at 83.1% (59-of-71) so this is one area that Quinnipiac possibly may be able to take advantage of in this game. 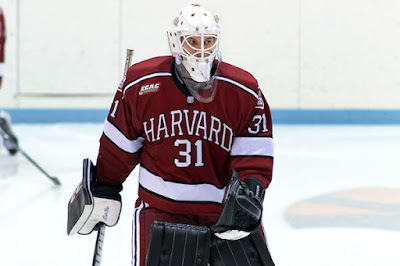 Harvard has played only one goaltender this season in Merrick Madsen and he has been very strong for the Crimson this season. He has had only two rough games, one against Quinnipiac in which he gave up some shaky goals and the other against Boston University when he let in five goals in a loss. Other than those two games he has been very strong in between the pipes for the Crimson in leading them to a great start. On the season Madsen is 9-2-1 with a 2.16 goals against average and a .917 save percentage. He has one shutout in the opening game of the season against Arizona State. Madsen has the size and athleticism to see the puck well and make the tough saves. This should be an interesting game in Cambridge on Friday night to see which Quinnipiac team shows up. If they play anywhere like they did against Robert Morris then Harvard will blow the doors off the Bobcats as the Crimson have significantly more talent than that of Robert Morris. Quinnipiac's players need to buy in at 100% or greater in order to maximize the talent on the roster. If they buy in at only 75-80% like Rand Pecknold said they did after the Robert Morris game, this team will have a lot of problems going forward in the second half of the season.